During Saxon times the area was owned by an Anglo-Saxon Lord called Bardi, a local landowner who is mentioned in the Domesday Book in 1086. The Normans dispossessed him and the original grant of the manor of New Sleaford and Holdingham known as the Manor of Holdingham was given to Bishop Remigius the first Bishop of Lincoln by William the Conquerer in 1072. Remigius had earlier provided Duke William with a ship and knights for the Battle of Hastings in 1066 and he was also a Domesday Commissioner. He had holdings in Bedfordshire, Buckinghamshire and Berkshire and church holdings in five other counties. The charter of William I which made the Norman Remigius the first Bishop of Lincoln can be seen in the Lincoln Cathedral treasury along with the Magna Carta. This Remigius (or Remi) had been almoner of the Benedictine Abbey of Fecamp in Normandy and had supplied Duke William with a ship and Knights for his work of conquest. He was the first Norman to be given an English Bishopric after 1066. 1072 was also the same year that the Bishop transferred his See from Dorchester in Oxfordshire to Lincoln. Circa 1135-1148 Bishop Alexander built Sleaford Castle, which stood in a field north west of the station. For most of the Middle Ages the Bishops of Lincoln held it as part of their episcopal estates including Hugh of Avalon the 7th Bishop of Lincoln who later was formally canonized by the Pope also becoming the first canonized Carthusian. Bishop Henry Holbeach, a Lincolnshire man and one of the compilers of the Prayer Book sold it to Edward Seymour, Duke of Somerset in 1547. He was the brother of Jane Seymour, Henry VIII's third and favourite wife and when his nephew, Edward VI became King on 28th January, 1547 aged nine (9) years old, he acted as the young King's Regent (Protector Somerset). In June, 1550, he exchanged the Manor of Holdingham for Glastonbury and Hull with the King. The Manor remained in the hands of the Crown until Queen Mary, grandly styled Queen of England, France, Naples, Jerusalem and Ireland who had married Philip of Spain, son of Emperor Charles V in 1554, who had nominated Philip, King of Naples for his wedding and abdicated two years later making him King of Spain and the Spanish possessions, conveyed it to Admiral Lord Edward Clinton in July, 1556. Clinton in turn sold the Manor to Robert Carre a member of the great landowning family of Carres and a client of his in 1559. A servant of Lord Hussey he died Lord of the Manor in 1590. The Lordship passed to his son Robert Carre of Aswarby who founded the Carre Grammer School in 1604. Having no children the title passed to his brother Sir Edward Carre, 1st Baronet in 1606. His son Sir Robert Carre, 2nd Baronet succedded to the Lordship in 1618. He founded the Carre Hospital in 1636. His son, Sir Robert Carre of Aswarby, 3rd Baronet, Chancellor of the Duchy of Lancaster, Member of Parliament and Whig Leader in Lincolnshire during the execution crisis became the Lord of the Manor in 1667. His son, Sir Edward Carre 4th and last Baronet was the next Manorial Lord receiving the title in 1682. Having no children the title passed to his sister Isabella, the Carre heiress in 1684. Isabella married the famous John Hervey (born 1665) at St. Martin in the Fields on 1st November, 1688 and they divided their time between a house in Bury, her house in Lincolnshire and a house in London which they shared with her mother, a sister of the politician Lord Arlington. John Hervey adored Isabella and they were idyllically happy; they had a daughter and a son, but she died in childbirth giving birth to a second daughter in 1693. In 1694 he succeeded his father as hereditary High Steward of Bury St. Edmunds as well as the Member of Parliament. He married again on 25th July, 1695 and it was this wife, Elizabeth daughter and co-heir of Sir Thomas Felton, 4th Baronet, another wealthy heiress who became Lady of the Manor. She was appointed in 1718 a Lady of the Bedchamber to the Princess of Wales and remained at court until the Princess's death as Queen Caroline, in 1737. Elizabeth's child bearing was a good deal more successful than Isabella's had been. Indeed one could say that her efforts were almost spectacular. She bore John Hervey six (6) daughters and eleven sons. John Hervey's friend the Duchess of Marlborough used her influence with those advising Queen Mary II in her last year of her reign to make him a peer and he was created Baron Hervey of Ickworth (peerage of England) 1703. Always a man with an eye to the main chance, he staunchly supported the Hanoverian succession. Consequently, he was able to gain favour with King George I who raised him to the dignity of Earl of Bristol (peerage of Great Britain) 1714 soon after the King's accession to the throne on the 1st August, 1714. In spite of all of these achievements, fate had a sad turn of events still in store for the Lord of the Manor. He was once more widowed in 1741 when the Countess died of a fit in her sedan chair in St. James's Park. He died in 1751 aged 86 and three (3) of his grandsons succeeded to the Earldom of Bristol and to the Lordship of this Manor. George William Hervey, 2nd Earl of Bristol who succeeded to this Lordship in 1751, was Ambassador to Spain 1758-61 and Lord Lieutenant of Ireland 1766-67. He subsequently became Lord Privy Seal in succession to Lord Chatham and First Lord of the Bedchamber. He died unmarried in 1775 of palsy from repelled gout. The Lordship then passed to his brother, Augustus John Hervey, 3rd Earl of Bristol, who held the office of Lord of the Admiralty between 1771 and 1775 and was made Vice-Admiral of the Blue in January, 1778. In 1779, having no children, the Lordship passed to his brother the Rt. Rev. Frederick Augustus Hervey, 4th Earl of Bristol. Born in 1730 he became Bishop of Derry. He was succeeded by his eldest surving son, Frederick William Hervey, 5th Earl of Bristol in 1803. He was Under Secretary of State at the Foreign Office. In 1826 he was raised to the dignity of a Marquess and styled the 1st Marquess of Bristol and died of gout Lord of this Manor in 1859. The title then passed to his son Frederick William Hervey, 2nd Marquess of Bristol who became the Member of Parliament for Bury St. Edmunds 1826-1859 and Treasurer of the Royal Household 1841-1846. His son, Frederick William John Hervey, 3rd Marquess of Bristol who was born in 1834 became Lord of the Manor in 1864. He was Member of Parliament for West Suffolk 1859-1864 and Lord Lieutenant of Suffolk 1886-1907. His successor in 1907 was his nephew, Frederick William Fane, Hervey, M.V.O. 4th Marquess of Bristol, who was son of Lord Augustus Henry Charles Hervey, M.P., second son of the 2nd Marquess of Bristol. Born in 1863 he became a Rear Admiral and Member of Parliament for Bury St. Edmunds 1906-7. His brother Herbert Arthur Robert Hervey, 5th Marquess of Bristol became the next Manorial Lord in 1951. Born in 1870 he became Minister and Consul-General to Colombia 1919-1923 and Minister to Peru and Equador 1923-1929. The title passed to his only son Victor Frederick Cochrane Hervey, 6th Marquess of Bristol in 1960. Born in 1915 he was Chancellor of the Monarchist Leaque for a number of years. In 1985 his eldest son Frederick William John Augustus Hervey became the 7th Marquess of Bristol and Lord of the Manor. On 1st February, 1991 Peter Norman Jones of Casterton, Victoria, Australia succeeded to the Lordship of the Manor of Holdingham. LORDS OF THE MANOR OF HOLDINGHAM, LINCOLNSHIRE - pre 1072 to the present. Remigius, lst Bishop of Lincoln - 1072. Robert Bloet, Bishop of Lincoln; consecrated - 1094. Alexander of Blois, Bishop of Lincoln; consecrated - 1123. Robert de Chesney, Bishop of Lincoln; consecrated - 1148. Geoffrey, Bishop of Lincoln; elected - 1173. Walter of Coutances, Bishop of Lincoln; consecrated - 1183. Hugh of Avalon, Bishop of Lincoln; consecrated - 1186 later becoming St. Hugh of Lincoln. William of Blois, Bishop of Lincoln; consecrated - 1203. Hugh of Wells, Bishop of Lincoln; consecrated - 1209. Robert Grosseteste, Bishop of Lincoln; consecrated - 1235. Henry Lexington, Bishop of Lincoln; consecrated - 1254. Richard Gravesend, Bishop of Lincoln, consecrated - 1258. Oliver Sutton, Bishop of Lincoln, consecrated - 1280. John Dalderby, Bishop of Lincoln; consecrated - 1300. Henry Burghersh, Bishop of Lincoln; consecrated - 1320. Thomas Bek, Bishop of Lincoln; consecrated - 1342. John Gynwell, Bishop of Lincoln; consecrated - 1347. John Buckingham/Bokyngham, Bishop of Lincoln; consecrated - 1363. Henry Beaufort, Bishop of Lincoln; consecrated - 1398. Philip Repingdon, Bishop of Lincoln; consecrated - 1405. Richard Fleming, Bishop of Lincoln; consecrated - 1420. William Gray, Bishop of Lincoln; provided - 1431. William Alnwick, Bishop of Lincoln; provided - 1436. Marmaduke Lumley, Bishop of Lincoln; provided - 1450. John Chedworth, Bishop of Lincoln; consecrated - 1452. Thomas Rotherham or Scot, Bishop of Lincoln; provided - 1472. John Russell, Bishop of Lincoln; provided - 1480. William Smith, Bishop of Lincoln; provided - 1495. Thomas Wolsey, Bishop of Lincoln; consecrated - 1514. William Atwater, Bishop of Lincoln; consecrated - 1514. John Longland, Bishop of Lincoln; consecrated - 1521. Henry Holbeach, Bishop of Lincoln - 1547. Edward Seymour, Duke of Somerset - 1547. Exchanged the Lordship of Holdingham for Glastonbury and Hull with the King in 1550. King Edward VI - 1550. Lady Jane Grey - 1553. Philip and Mary - 1553. In 1554 Queen Mary married Philip of Spain who after their marriage became King of Naples. In 1556 his father Emperor Charles V abdicated making him King of Spain and the Spanish possessions. Admiral Lord Edward Clinton - 1556. Robert Carre of Aswarby - 1590. Sir Edward Carre, 1st Baronet - 1606. Sir Robert Carre, 2nd Baronet - 1618. Sir Robert Carre of Aswarby, 3rd Baronet - 1667. Sir Edward Carre, 4th & Last Baronet - 1682. Isabella Carre - 1684 The Carre heiress and daughter of Sir Robert Carre of Aswarby, 3rd Baronet, married John Hervey 1st November 1688. Isabella had one son and one daughter but died in childbirth having a second daughter in 1693. John Hervey remarried again on 25th July 1695. 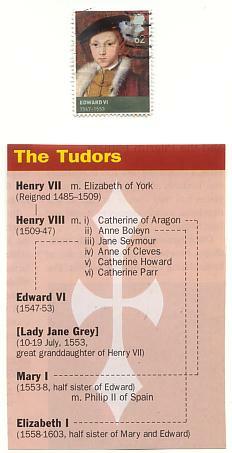 His wife, Elizabeth bore him six daughters and eleven sons. Created Baron Hervey of Ickworth in 1703 and Earl of Bristol in 1714, three of his grandsons succeeded to the Lordship of Holdingham as well as the Earldom of Bristol. Augustus John Hervey, 3rd Earl of Bristol - 1775. Rt. Rev. Frederick Augustus Hervey, 4th Earl of Bristol - 1779. Frederick William Hervey, 5th Earl of Bristol - 1803. Created Earl Jermyn and Marquess of Bristol in 1820. Frederick William Hervey, 2nd Marquess of Bristol - 1859. Frederick William John Hervey, 3rd Marquess of Bristol - 1864. Frederick William Fane Hervey, Member of the Royal Victorian Order, 4th Marquess of Bristol -1907. Herbert Arther Robert Hervey, Grand Cross of the Order of the Sun of Peru, 5th Marquess of Bristol - 1951. Victor Frederick Cochrane Hervey, Grand Officer of the Royal Order of Alexander of Bulgaria and of the Crown of Afghanistan, 6th Marquess of Bristol - 1960. Frederick William John Augustus Hervey, GOStA and Grand Cross of the Order of St. Lazarus of Jerusalem, 7th Marquess of Bristol - 1985. Peter Norman Jones, Knight Commander of the Order of the Eagle of Georgia and the Seamless Tunic of Our Lord Jesus Christ. Present Lord of the Manor - 1991. King Henry II of England wanted to show that he regretted four (4) of his knights had murdered Thomas a Becket, Archbishop of Canterbury, in front of the alter of Canterbury Cathedral in Kent on 29th September, 1170. One thing King Henry did was to bring some monks to England from the famous French monastery of the Grande Chartreuse (Great Charterhouse) who were called Carthusians to help strengthen the Church in England. The King gave them land at Witham in Somerset where they built their house in a large forest. After one of the Priors died and another returned to France a monk, Hugh of Avalon was sent as Prior to take command. Hugh was born in 1140 the youngest son of Lord William of Avalon a Burgundian knight. He was educated at the convent of Villardbenoit, became a deacon of the Austin canons at 19 years of age and was appointed Prior of a monastery at Saint-Maxim. Hugh was 39 when he was called to England to take charge of Witham Abbey, the first Carthusian house in England which was founded by King Henry in 1178 as public penance for the murder of Thomas a Becket. After 7 years at Witham Abbey King Henry decided that Hugh should become a Bishop and in 1186 he was appointed as the 7th Bishop of Lincoln which was one of the largest diocese in England and included the Lordship of the Manor of Holdingham which he held as part of his episcopal estates. Hugh wanted to remain at Witham, however he finally consented and upon his arrival in Lincoln he found the huge diocese had been neglected for many years and Lincoln Cathedral almost in ruin. He immediately set about putting things back in order in the city and rebuilding the Cathedral. Twice a year Hugh returned to Witham to live as an ordinary monk for a month and in 1199 he made a pilgramage back to Chartreuse in France. Hugh's greatest work was the re-building of Lincoln Cathedral. He died in November, 1200 and was buried in Lincoln Cathedral. Amongst those present at his funeral were England's King John, the King of Scotland, nobles and princes. In 1220 Hugh was canonised. Saint Hugh of Lincoln is the Patron Saint of sick children. THE MANORIAL SOCIETY OF GREAT BRITAIN. The Society was founded as an association of Lords of the Manor in England and Wales in the early years of the last century and it has grown to include Irish and Scottish Barons, Lords and Superiors. It existed then, as it still does, to foster an interest in history and British tradition, of which the Manor has formed one of the hubs, since the reign of William the Conqueror, more than nine centuries ago. 'DNS CUR BARO' is a diminuitive for 'DOMINUS CURIA BARONAM' - Lord of the Court Baron, the Court of the Freeholders, or the baron's men, presided over by the Steward to the Lord of the Manor. The crimson and ermine represent manorial lordship. The Norman pillars and arch represent Monarchy, founded by William the Conqueror. The Monarchy was based on military land tenure through the Manor. The English Manors, as described in the Domesday Book in 1086 were the pillar and keystone of government. 'PER VIRGAM' - "By the Rod". The rod or wand is the symbol of office and is carried by the Steward or Bailiff of the Manor representing the authority delegated to him by the Lord. All males of the age of 16 and over are entitled to attend Court and on admittance are tapped on the left shoulder with the tip of the rod. The rod also symbolizes the Court's power to inflict punishment. Lists of admittances in court rolls and books often began with "per virgam". The Acanthus leaf coronet is the coronet of the Manorial Lord differenced accordingly from Royal or Noble coronets. Green represents the spring growth of corn and gold the harvest. The tie-pin is for daily use by Lords and Barons and the brooch is for Lady consorts. 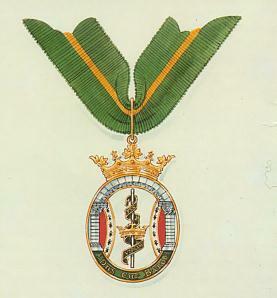 The insignia was designed by Cecil R. Humphrey-Smith OBE, FSA Principal of the Institute of Heraldic and Genealogical Studies and authorized by Sir Colin Cole KCB KCVO KStJ TD BCL MA FSA (sometime Garter Principal King of Arms). Acanthus from the Greek 'akanthos' also known as Bear's Breech are hardy perennial plants native to the Mediterranean producing tall spikes of white, pink or mauve flowers which can reach 1.2 metres/4ft. in early Summer. 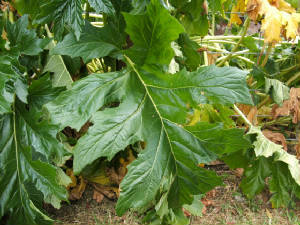 However it is not the flowers but the large dark green glossy shaped leaves that have been used by Artists and Architects alike over the centuries to depict foliage. The Acanthus leaf has been used as a decorative motif since antiquity and can be seen on borders, ceiling roses, corbels, fountains, tiles and wallpaper. The ancient Greek culture was the first to use the Acanthus leaf ornamentation which the Romans further stylised with the curling of ends of the leaves. William Morris, the renowned 19th century English artist, author, designer and publisher used the Acanthus leaf pattern liberally, forever linking it with the Victorian era.